In the past we have discussed the fact that the web security company Sucuri’s scanner SiteCheck is rather poor at what it does, including falsely claiming that a website was infected with malware due to a bad false positive and claiming that a website was running on outdated software without knowing if that was true. It would appear they are claiming that a website is defaced just due to the words “hacked” and “website” in the title of a page, which clearly isn’t reliable to determine if a website is defaced. On top of that they are claiming an issue that doesn’t actually exist is of “Critical” severity. We of course can spot that their claim was wrong since we deal with websites that are actually hacked all the time (and it was quite obvious at least in this case), but based on plenty of experience dealing with people that think that their websites have been hacked, we would guess that a lot of webmasters and owners could be mislead by this type of thing, leading to some of them paying Sucuri to clean up a hack that didn’t exist. 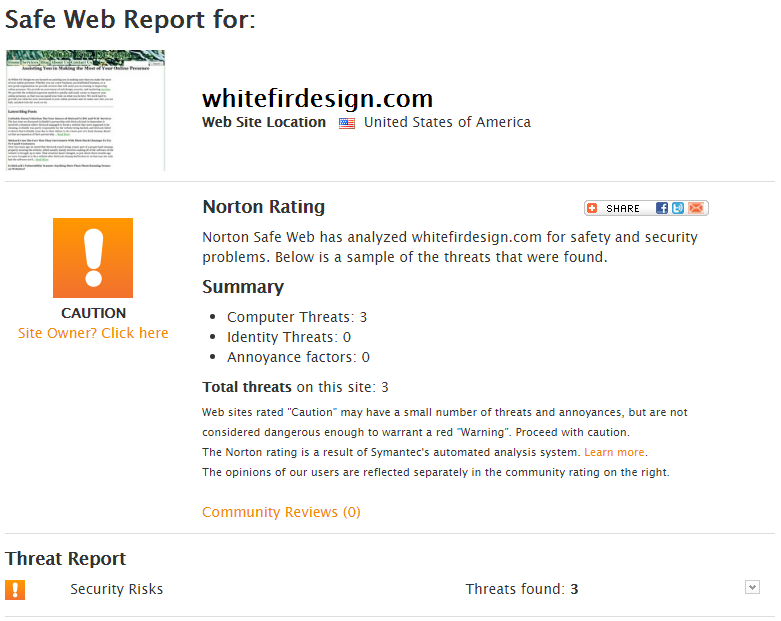 Web sites rated “Caution” may have a small number of threats and annoyances, but are not considered dangerous enough to warrant a red “Warning”. So unlike Sucuri they don’t think that it should get a red warning. While Sucuri warning if websites are actually blacklisted by other services would be useful, it should be accompanied by a disclaimer that the other services results may not be accurate instead of overhyping the issue to try to sell their services. Based on all that there is plenty of reason to avoid Sucuri’s SiteCheck, but what is a better way to confirm whether your website is hacked if you believe it is? The simple answer is to contact us, as we are happy to do a free check to confirm whether a website is hacked or not. We don’t rely on low quality automated tools to do that, since they produce poor results as was shown above. Instead we will discuss the situation with you and then do any necessary checking to look into the possible issue. For websites that are hacked we will also provide a free consultation on how best to deal with the issue, instead of trying to scare you into using our services, unlike Sucuri.